News & Events | Breugel Bouviers Perm. Reg'd. Can Ch. Breugel’s Bell of the Ball – Our Newest Champion! Can Ch. Breugel’s Blackfire Maverick – New Champ! Palay Ain’t No Angel Breugel passes her CGN! Breugel siblings clean-up at 2012 Alberta Specialty! Can Ch. Angelbrin Lola at Breugels our newest Champion! Can Ch. 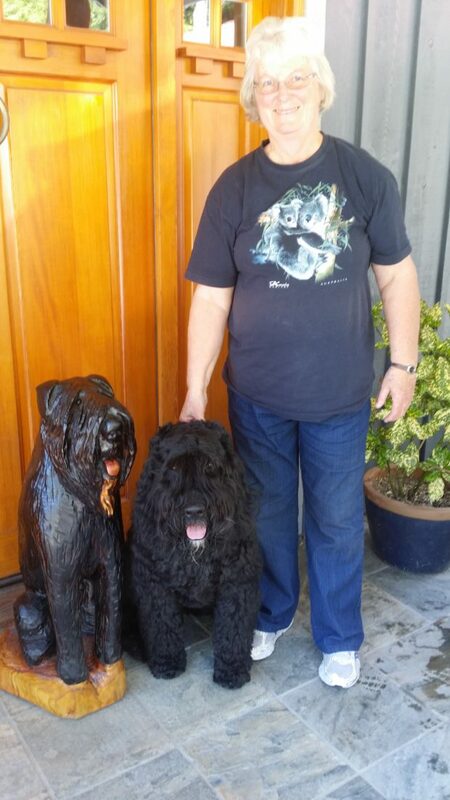 Breugel’s Mystical Marcus – our newest Champ! Breugel’s Ain’t no Angel passes her Herding Test! Can Ch. Breugel’s La Femme Nikita – New Champion! 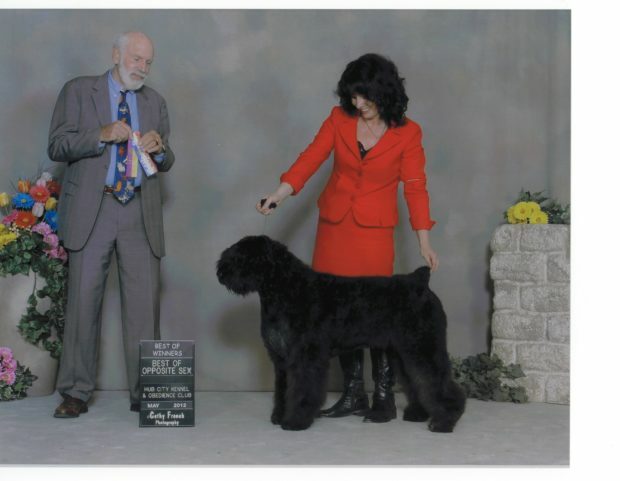 Breugel’s Quantam Bear takes puppy Sweeps! Breugel’s Cara Bella – takes BOB! 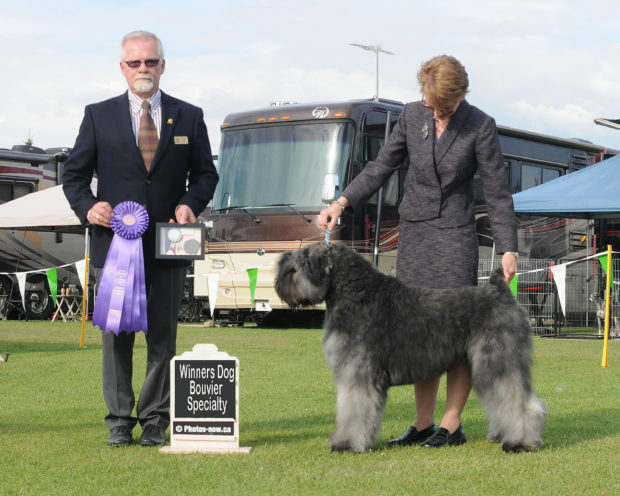 It is with a heavy heart that I announce that my dogs will no longer be shown in CKC Conformation Shows until such time that the national Bouvier des Flandres Club of Canada changes the standard to allow for dogs with natural tails. Cosmetic surgery has been banned in some European Countries as early as Jan, 1988. We are talking over two decades of scientific evidence proving that it is unecessary, inhumane and cruel. I have been on the “Au Natural” ban wagon since 2005. Going against my own convictions and docking tails until it was banned in BC in Oct, 2015. No more! I am finally taking a stand. And I ask you to do the same. Say No to adopting a puppy from a Bouvier breeder that supports unnecessary cosmetic surgery on their puppies like ear cropping, tail docking and dewclaw removal. Better yet, contact the breed clubs and CKC and make your position known. Members of B.C. 's College of Veterinarians have voted to ban cosmetic tail docking of dogs, horses and cattle. The college says the more than 91 per cent of members who took part in a recent vote cast ballots against tail docking. Such wonderful news for our breed. Now we just have to wait until the breed clubs get on board and change the standard for our breed. Starting today all puppies reared by myself will be adopted out OH NATURAL! Hence, if you are looking for a cropped, docked or cropped and docked puppy? You need NOT apply. Personally, I have been waiting for almost 15 years for this WIN. Patience is a virtue! On October 28th, 2015, the College of Veterinarians of BC voted to ban the cosmetic procedure of ear cropping. Did you know it’s illegal in Europe to do cosmetic surgery on dogs? 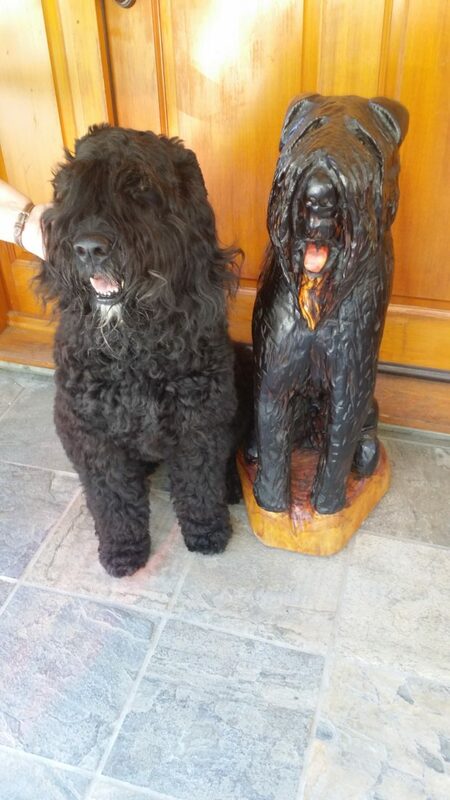 Here at Breugel our dogs and puppies come first and as such we will not crop ears nor dock tails. Nor will we sell a puppy to anyone wanting to do so. Please join our plight and say NO to ear cropping. Do it for the dogs sake! Ch. Breugel’s Bell of the Ball sat on 9 points waiting for some much needed competition to get that last point for her Canadian Championship. – Thank you Lydia for showing the little lady. Thank you Karen for keeping her in show coat. I see the clippers on the horizon! Can Ch. 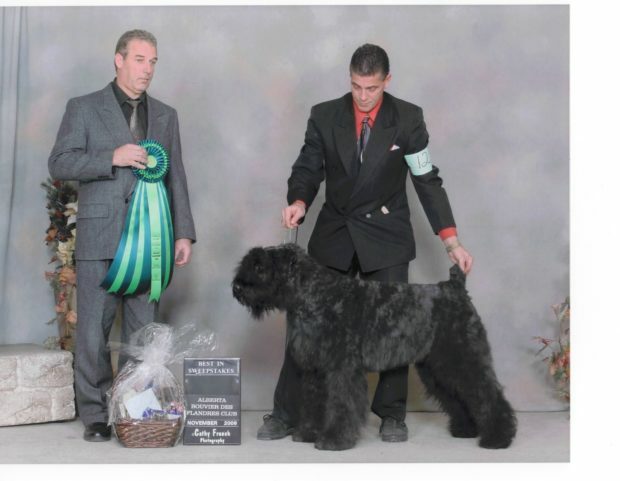 Angelbrin MovlikJager Breugel gets his Canadian Championship in a few limited shows in BC. Thank you Aaron Andrish and Jenna Lostale for showing my boy. Thank you Carolyn for letting me take Jag on the road with me. 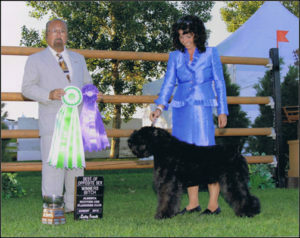 Breugel’s Black Fire Maverick gets his Canadian Championship in just three shows finishing off with Winners Male at the Alberta Bouvier Specialty. Thank you Connie Krohn and Trina Neil for handling my very special boy. Thank you Steven and Deb for maintaining his show coat. Miss Angel passes her Canine Good Neighbour (CGN) test on her first try. Not too shabby. Way to Go Mamma Jan! BISS Can Ch. 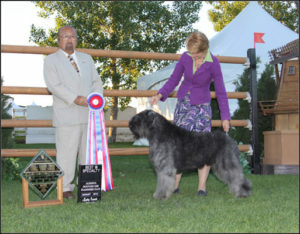 Breugel's Mystical Marcus goes Best in Show at the Alberta Bouvier Specialty. His sister Can Ch. Breugel's Torres at Angelbrin takes Best of Opposite and Winners Female at the Show. Can CH. Angelbrin’s Lola at Breugels racks up 9 Best of Breeds in her very limited 2 month show career. CH. Breugel’s Mystical Marcus completes his championship with 8 BOBs and a Group 3 in just 2 months of limited showing. Palay Ain’t No Angel Breugel passes her Herding Instinct Test first time out with flying colors!! What a girl. Not too shabby for a dog that has never seen sheep before! Way to Go Mamma Jan! CH. 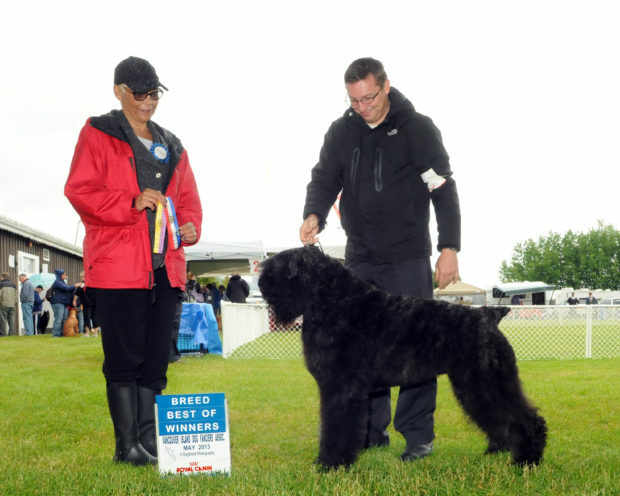 Breugel’s La Femme Nikita racks up 2 Best Puppy in Group (BPIG), Group 3, Group 4 and a Reserve Winners Female(RWF) in her very short and limited show career. Way to go Deb & Les! 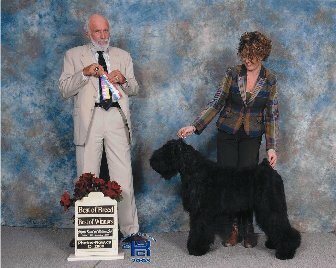 Mr. Bear aka Breugel’s Quantam Bear wins Puppy Sweepstakes and takes Reserve Winners Male at the Alberta Bouvier Des Flandres Specialty. Way to go Deb and Les! 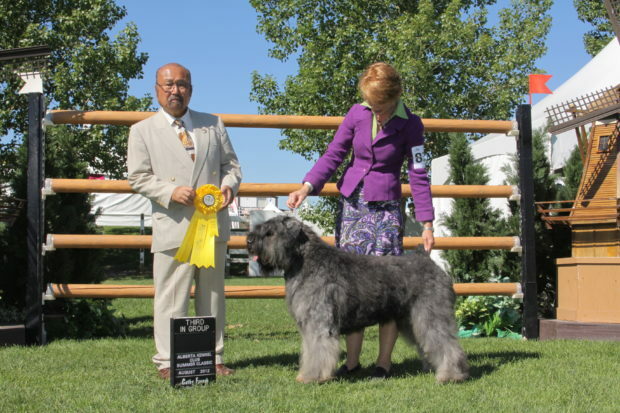 Mia aka Breugel’s Dora the Explorer takes two Reserve Winners Female at the Edmonton dog show. Way to go Chad and Andrea! 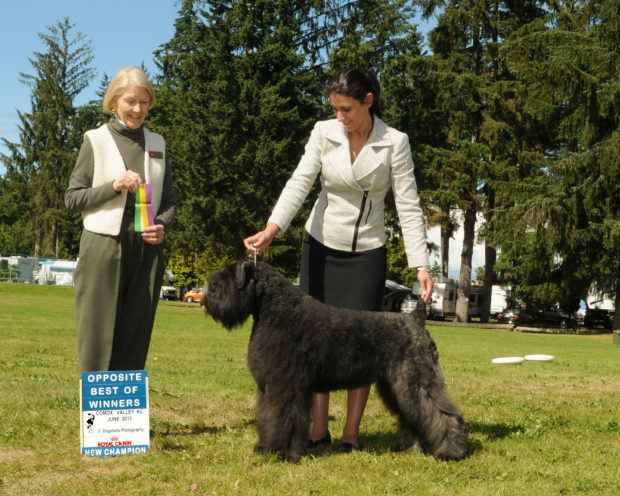 Saphira aka Breugel’s Cara Bella takes Best of Breed at the Port Alberni dog show. 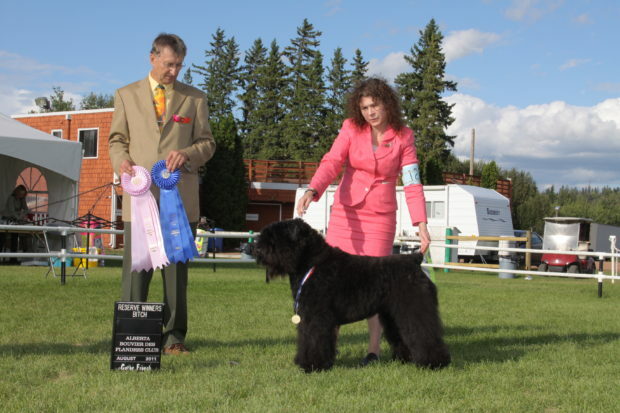 Blaze goes Best of Breed for two consecutive days at the Alberta Kennel Club dog show, finishing his championship in just two shows at the early age of just 9 months. Way to go Deb & Larry!